Romania. We really didn’t have the first clue what to expect from the country. Think about the Ceașescus, the 1989 revolution, and the orphanages and aid convoys in the aftermath. But it’s been a part of the EU for the last five years (whether it should have been or not is another question, of course), and that’s got to have left traces, right? When we arrived at the Iron Gates dam, and the border from Serbia, we found… a queue. By far and away the biggest queue we’ve had at a land border on the trip. It moved, slowly, though, with the shabby random dogs lying in the shadows gazing half-heartedly around. Eventually, we were out of Serbia, and onto the dam and no-man’s land. On arriving at the Romanian border, the first thing we noticed was the number of dead cars parked in every possible place, within the border itself. Western European plates, mainly, but many Romanian plates. What was the score? Confiscated for smuggling? No papers? Who knows. Eventually, we got through the police passport check, and moved forward to the customs guy. He took a quick look at the van, our passports, then us – “English?” Yes. “Why you come to Romania?” Well, we’re on a long trip, and we want to see your country. “Ah, then… You have a map?” With the queue building gently behind us, he proceded to spend ten minutes poring over the map and telling us the best places to go and the best things to see. I’m starting to really enjoy border crossings. Once we’d found a cashpoint, and got over our surprise at the Lei notes it dispensed (they’re all printed on plasticy paper! ), we headed off to see what the reality would deliver. Our first real stop was the town of Băile Herculanea. The outskirts of the town had a real dishevelled, down-at-heel, peasant feel to them, with decrepit fences around muddy threadbare fields. The station, though, hinted at something else entirely – a wonderfully over-the-top confection of fin-de-siecle elegance, now gone slightly to seed. 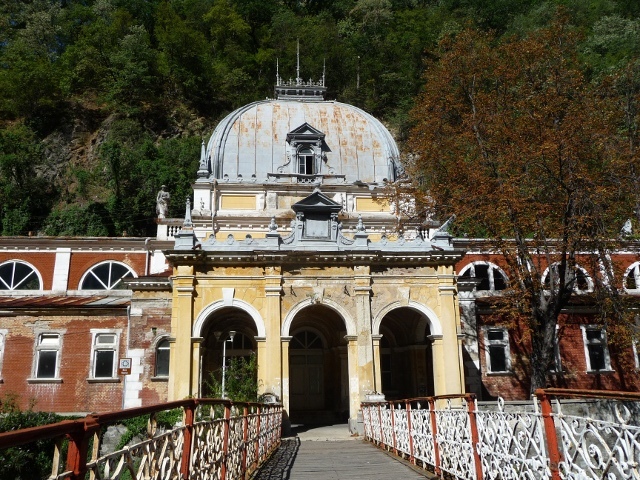 The town itself has been a renowned health spa for years, and was a fashionable resort in the early 20th century. Lush and sumptuous bath houses, civic buildings and hotels were erected all over what’s now the old town centre. Post-war, a concrete new town was put up a little further down the valley, but that’s not what we want to see, is it? We parked up outside the Neptune Baths, and wandered over the rickety bridge to the town centre, basking in the sunshine as we meandered down the arcades of the town museum (long since closed and emptied), but thoroughly ignored the alleged health benefits of the spas themselves – why is it that the better the water is meant to be for you, the worse it smells? Herculanea is not just a spa, though – the waters themselves rise from springs in some stunningly jagged limestone mountains above the town, so we took a road climbing steeply through those, then through the Cerna valley, heading eastwards. Eventually, we came to Tismana, home to the oldest monastery in Romania, founded in the 14th century (although completely rebuilt several times since). Beautifully maintained and detailed cloisters are lined with colourful and well-tended flowerbeds, surrounding a church with layered octagonal towers. In one corner of the monastery, a small museum protects ancient frescoes removed from a previous iteration of the church. But the over-riding impression we left with was one of tranquility. From the flowers to the nuns smiling as they wander, giving out a joyous radiation of peace and contentment, the whole place just seemed to be quietly enjoying life. 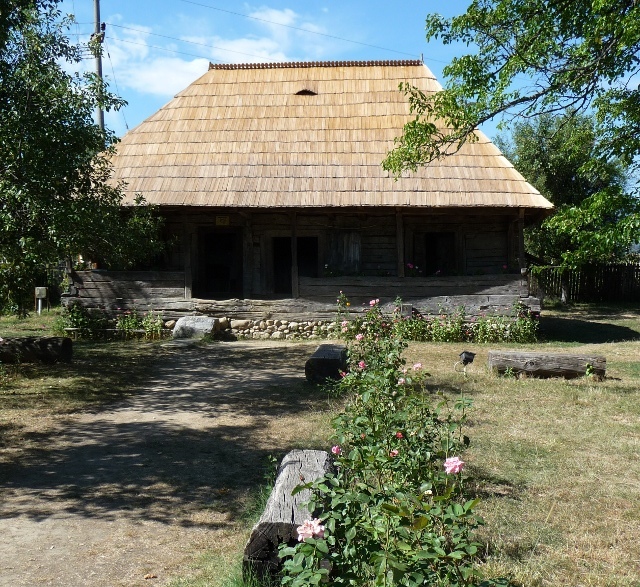 A little further along the road, the tiny village of Hobița contains the house where Constantin Brancusi was born. It’s a simple wooden hut, three rooms in a line, all accessed from beneath a veranda sat in deep shade from the steep wooden shingle roof, and it’s been preserved as it would have been when he lived there. 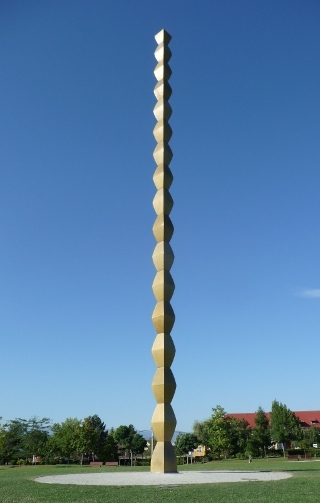 Brancusi is reckoned to be Romania’s greatest artist of recent years, a sculptor whose international repute derived from his simplification of his sculptures to their most basic forms. 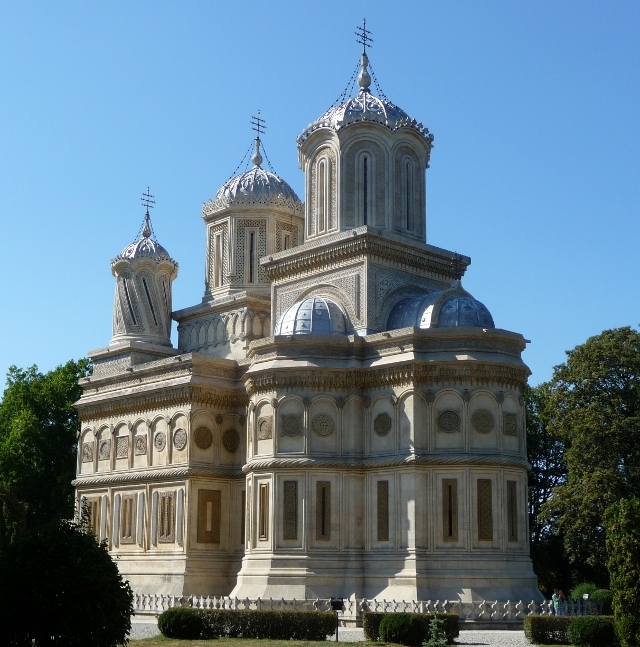 The nearby city of Târgu Jiu was intended to have twelve pieces placed in public spaces as a memorial to the first world war. He died, though, before they were all delivered, but all four which he did complete are still present. 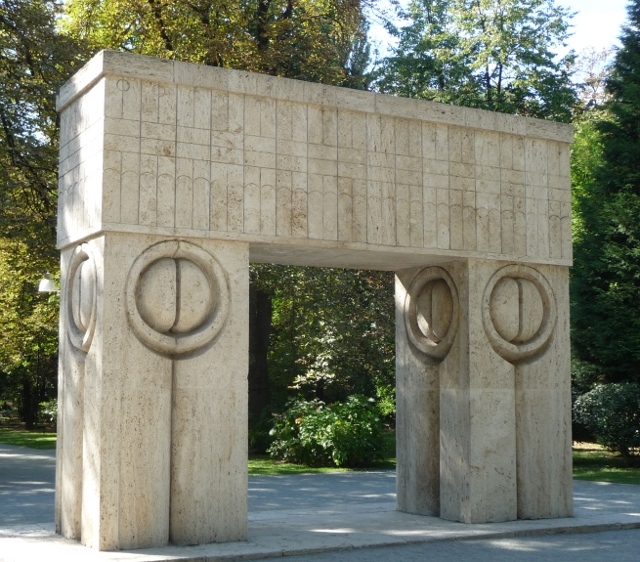 In a park in the town centre, a tree-lined alleyway leads from the Gate of the Kiss, a simplified triumphal arch, past the Avenue of Seats, 30 stone egg-timer shaped stools, to the Table of Silence, another dozen stools around a simple stone table. 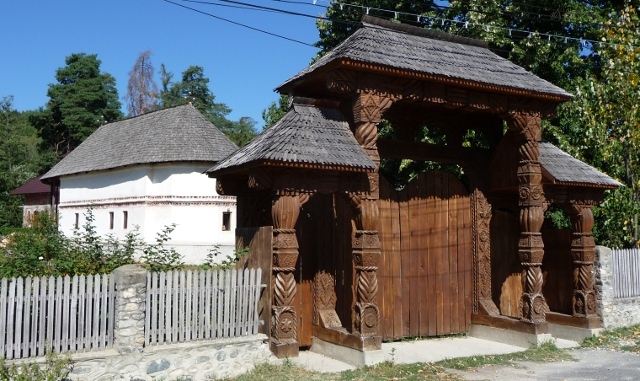 At the opposite end of the town’s main boulevard, the Endless Column rises from another small park, the repetition of simple shapes echoing the carvings on the veranda posts of the village house. Continuing eastwards, an overnight break was taken at a small campsite behind a restaurant and bar in the town of Horezu. Dirt cheap, both for the camping and cold beer from the bar, the camping area itself was mainly occupied by small but cute wooden cabins – and a large number of semi-feral dogs. In the morning, we headed through the town, pausing briefly to grab some Gogoși for breakfast. Clearly a popular snack, these doughnuts-without-holes were hot and tasty – just what was required. Our guidebook said almost nothing of the town itself, which we thought strange when we noticed the amazingly beautiful church in the middle. Surrounded by yet more colourful flowerbeds in full bloom, every single arch on the church walls was painted with a representation of a saint – and that was just on the outside! 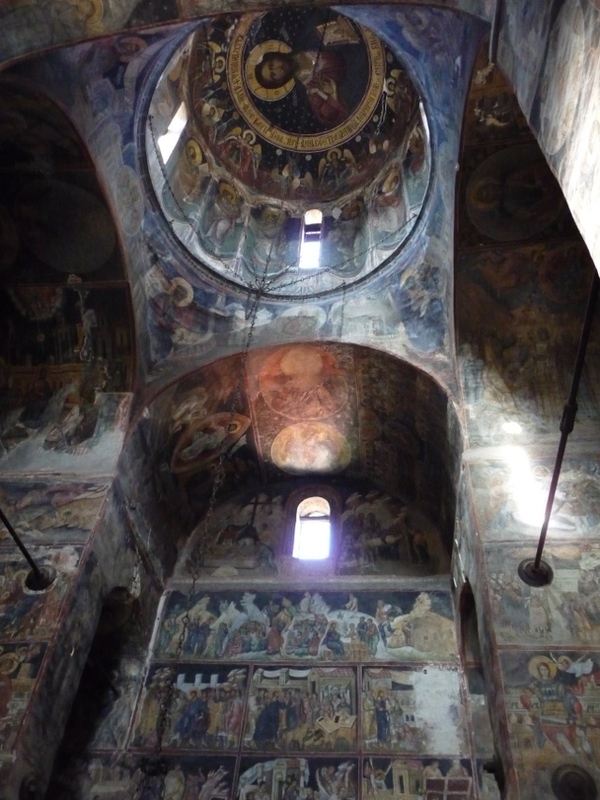 The porch was fully frescoed, and passing through the ornately embossed iron-clad doors showed yet more frescoes in the dim light, in front of the intricately carved wooden iconostasis. The tourist office in the village also turned out to be a bit of a gem – the very effusive and friendly chap exercising his French to explain far more than we needed to know about the area, its attractions and traditions. From somewhere in the depths of his stores, he extracted some very lavishly produced brochures on different aspects of the country, which he handed over with glee. Tempting though the local pottery museum was, we headed out of the village towards the Horezu monastery a couple of km away. 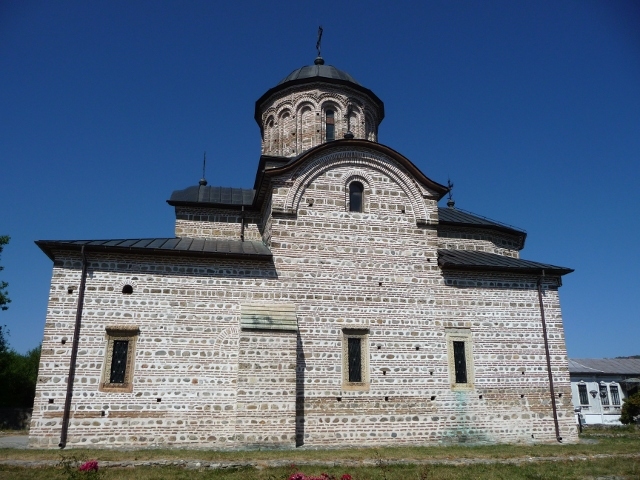 UNESCO protected, it’s very similar to that we’d seen at Tismana, but more so – built in the 17th century, it’s said to be the finest example of the school of architecture defined and named after Constantin Brâncoveanu, ruler of Wallachia (this southern region of Romania) at the time. It was certainly impressive, with elaborate stone staircases to the cloisters, and even more vibrant frescoes in the porch and church. Around the outer walls of the cloisters, the monastic complex contained various wooden store buildings and a couple of other small chapels, before heading back out of the beautifully carved wooden gates into the village again. As we walked past the cluster of stalls outside the gates, we had a chance to have a better look at the pottery that Horezu is known for. Mainly plates, they feature intricate hand-painting, often looking like marbled cake icing or spider webs. A small wooden hut down the road had an exhibition of some work by local craftsmen, with a wide variety of colours and styles, but all very clearly related. 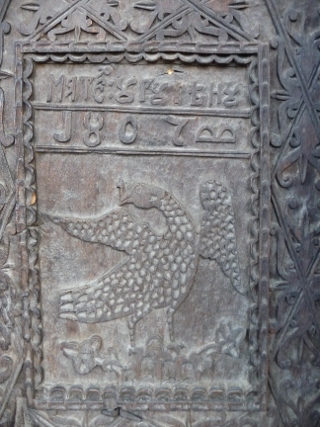 Before we headed onwards, we had a quick peak in past yet more ornate wooden gates, barely metres from the main entrance to the monastery. This time, the church sitting behind was much smaller and simpler, but equally elegant. Another couple of monasteries were just up the road. 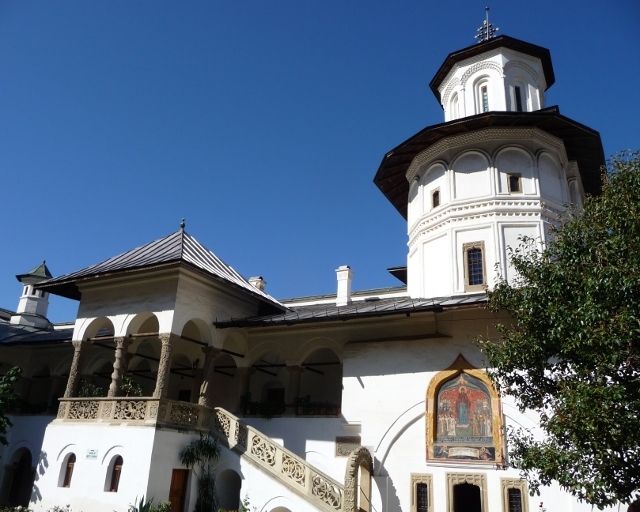 We had a quick look at Bistrița, but it didn’t really float our boats – maybe it was just much more of a “working” monastery, but the untrimmed and weedy grass seemed in sharp contrast to Horezu and Tismana. 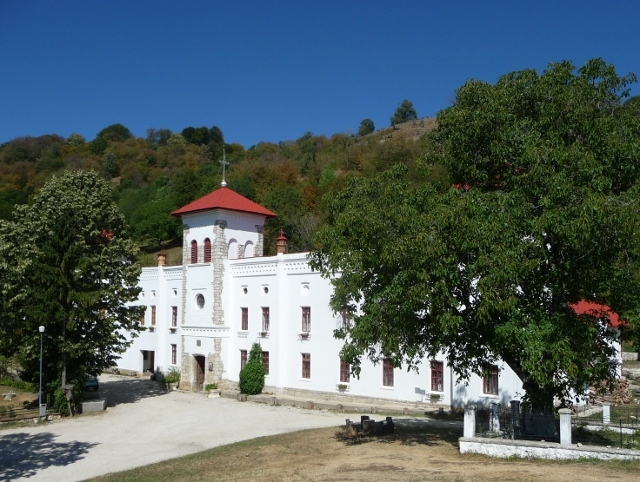 However, high above Bistrița sits another monastery, Arnota. The sign took us around a bridge that was being rebuilt, and up a dirt track which just kept climbing and winding, before arriving at the ramshackle gates of a quarry. Had we come the wrong way? No, the barrier opened, and we were waved through and round a corner of the yard before seeing a sign pointing up another track. Finally, we arrived. The monastery wasn’t as big or quite as picturesque as the first two, but it definitely had that feeling that had been lacking from Bistrița. 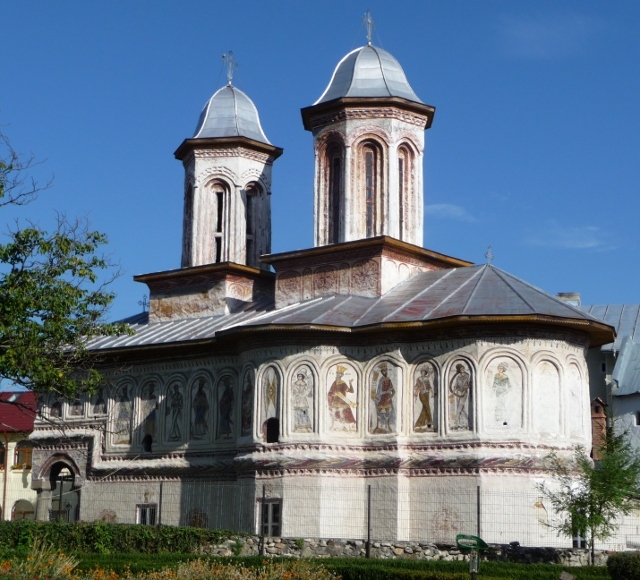 Curtea de Argeș was our next stop, capital of the region in the 14th century. Much of the legacy of that status is now no more than ruins, but the Princely Church still stands in remarkable condition, the oldest in the country. From the outside, it’s truly astonishing. The exterior twiddles and flourishes are massively overdone, and almost no surface has been left alone. The basic form of the building is probably very similar to the “masterpiece” which it replaced in the late 19th century, but the overblown detail was entirely the work of that era – a “restoration” process very similar to that of Viollet le Duc at Carcassonne, with a similar effect. Inside, the frescos were bright and vibrant – but utterly lifeless, lacking any kind of soul whatsoever, almost a parody of the restrained dignity we’d seen elsewhere. With that, and with evening approaching almost as fast as Ellie’s birthday – just one more full day away – we headed towards Bucharest. With the reminder of last year’s birthday and the disappointment of V-l-D’s “Catharland” theme park fresh in her mind, Ellie was adamant that she didn’t want to spend her birthday in the city, but a quick look at the map suggested there wasn’t really a lot of sense in delaying it until later in the trip. Maybe we could do the city in a day, and be out into the countryside again in time? This entry was posted in Art & Culture stuff, By Country - Romania, Food stuff, Personal stuff, Travel stuff. Bookmark the permalink.